Prakash Jha’s Satyagraha is a political film that, for all its well-meaning bluster, neither stings nor scalds. It fails to hit the core of the truth that it seeks. Ambikapur: a fictional small-town in India. ‘Satyagraha’ manages to stir the latent patriotic fervor in its audience but is deeply flawed in its execution. Sadly, this call to our conscience doesn’t. Satyagraha reflects the anger and the restlessness of a nation and suffering of a ordinay man to the corruption. 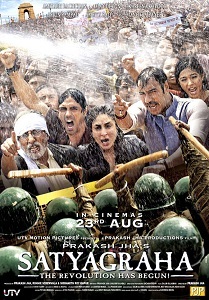 -Overall, Satyagraha leaves behind a powerful and noteworthy message for the society. The message could have been even stronger if it had been better executed. Anyways, go ahead and join this Satyagraha revolution without any hesitation. 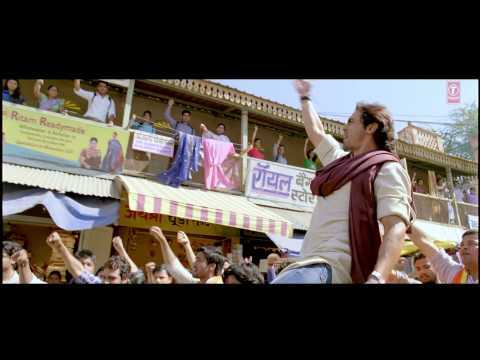 Certainly Big B and Ajay Devgn are the most amazing talents in our industry.. 'Satyagraha' proves that..
Prakash Jha tries to showcase the ire of the middle-class, the bottlenecks in bureaucracy, the red-tapism, the corruption and the ‘politics’ behind a demonstration that has been the norm these days. If you still find yourself marvelling at the man's screen presence, that's Amitabh Bachchan for you. As corruption erupts what's the best satyagraha - to preach or practice? Predictable story spoon-fed with sincerity! For telling it like it is and for creating a compelling film out of the raw material of present-day corruption, the film deserves a standing ovation. Satyagraha is nothing but a superficial and half-baked attempt at putting forth a volatile socio-political issue. Watch it only for the performances. Before anything else, I would like to take this opportunity to express my heartfelt gratitude to Prakash Jha. Overall, Satyagraha leaves behind a powerful and noteworthy message for the society. The message could have been even stronger if it had been better executed. Anyways, go ahead and join this Satyagraha revolution without any hesitation. Despite her ancient culture and history, human life is of no value in India, and while the greedy and unethical pillars of society get richer, the poor starve in penury. Satyagraha sadly crumbles and fades with the weight of trying too hard. Satyagraha is an average fare but its business at the box-office will be below average due to the below-the-mark start and lack of universal support, especially lack of youth support. Satyagraha takes inspiration from Anna Hazare and Arvind Kejriwal's anti-corruption movement and churns out social drama that would inspire the audience if not enrage them.